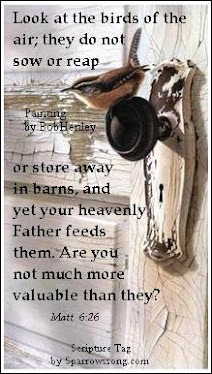 Thank you for all of your sweet comments, and emails about my prayerful post for the areas hard hit by hurricane Sandy. Please continue to pray for those who are still dealing with the aftermath of the historic storm. 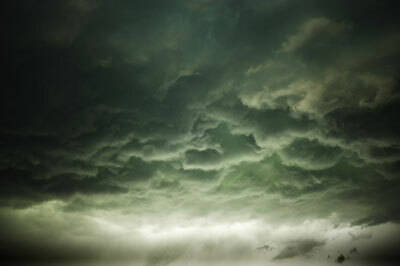 We have had rain, some fog and some mild wind the last few days and are under a flood watch for the county. 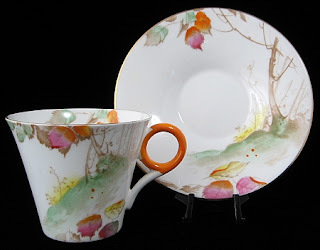 Leaves are everywhere, so I was prompted to share this marvelous art deco era Shelley China, England tea cup and saucer with a fall and leaves design. The art deco hand colored on transfer landscape design is called Trees On A Hill With Leaves, which was a long title for Shelley. 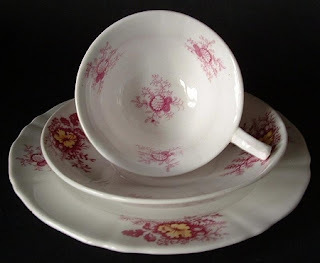 The cup and saucer was made between 1933 and 1945, and I love the deco handle and shape. This art deco shape is called Regent, and wasn't made for very long. Such an autumn design! I can't believe that November starts tomorrow! A shock! 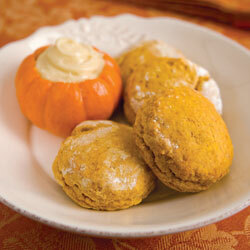 I wanted to share this seasonal recipe I found in Tea Time Magazine, a favorite publication....Pumpkin Scones With Maple Butter. I love the way the cream is served in mini a pumpkin! I have made these and they were wonderful, but don't have photos...forgot to photo them before they were gone! • Preheat oven to 425°. Line a baking sheet with parchment paper. salt, cinnamon, allspice, and nutmeg. necessary, until mixture forms a loose dough. wire racks to cool slightly. • Serve warm with Maple Butter. 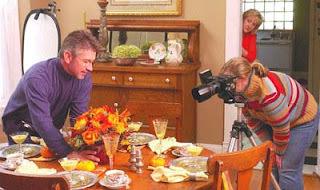 I found this photo and article about a Tea Time Magazine photo shoot in a Decatur, IL article from 2007 which is fun to read. To read the article, click on the photo. 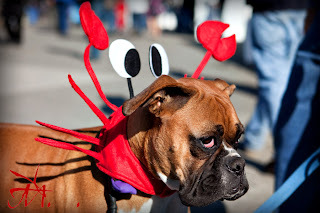 I am joining the following blogs...please visit them and enjoy the wonderful posts. 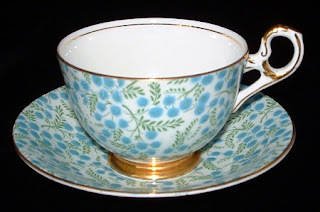 For more info on the teacup at Antiques And Teacups, click on the photos. 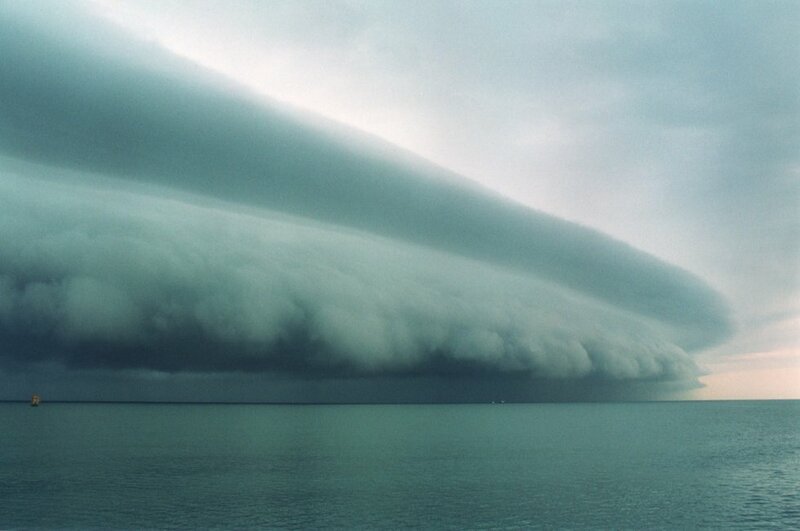 Stay in, have a cup of tea and pray for the east coast as they begin the long recovery. Welcome to my usually linking blog friends to a different Tuesday Cuppa tea. 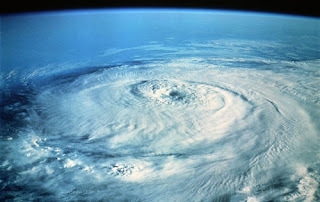 I just haven't been able to concentrate on getting a teacup post up...I am too concerned for friends, colleagues and customers who live under the threat of the mega storm hurricane Sandy approaching to day. And will be waiting for you to emerge from the other side of this difficult time with stories of bravery, endurance, shared fear and laughter and strength found in hard places. 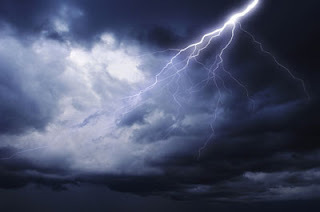 I am not doing a linky this week...not only because of the storm and my preoccupation and prayer for those involved, but also because of the dark elements of the halloween holiday that I just don't feel comfortable with participating in. So I will see you later in the week, hopefully with the storm behind us and a fresh new world of hope and appreciation of blessings ahead. Hello and welcome! 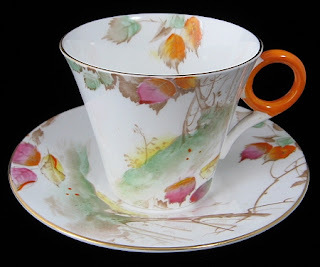 My post for Teacup Thursday is a bit late today...we had another meeting to go to in Port Angeles given for/by the American Parkinson's Disease Foundation which is a great source of info for my husband's condition, and I came home with a headache...don't know why. Could have been some perfume/hairspray/Bounce., as I am allergic to those. Ah well. 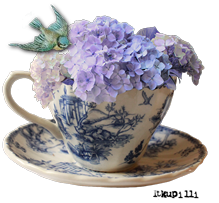 Had a cup of tea and some dinner and felt like I could tackle my post, because I have a wonderful teacup to share! 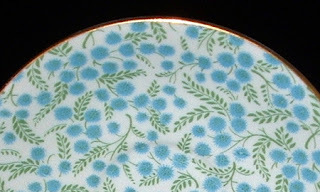 The chintz looks like little puff ball flowers and branches, doesn't it? 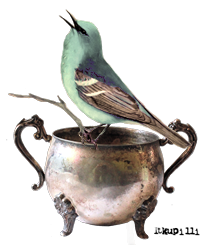 I just love this turquoise, green and white chintz teacup I found a year or so ago in a favorite antiques fair in Gloucester, England. The maker is Old Royal, which is actually made by Sampson Smith. 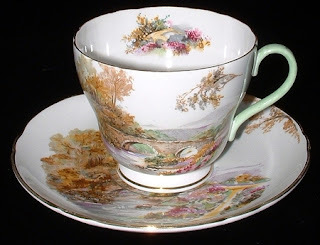 The cup and saucer dates to 1931-1940 and is so pretty! 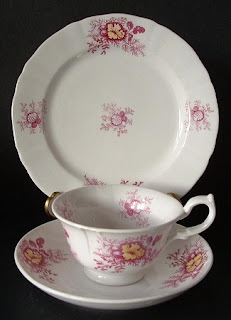 I love the gold trim and elegant vintage shape, and I always love chintz! 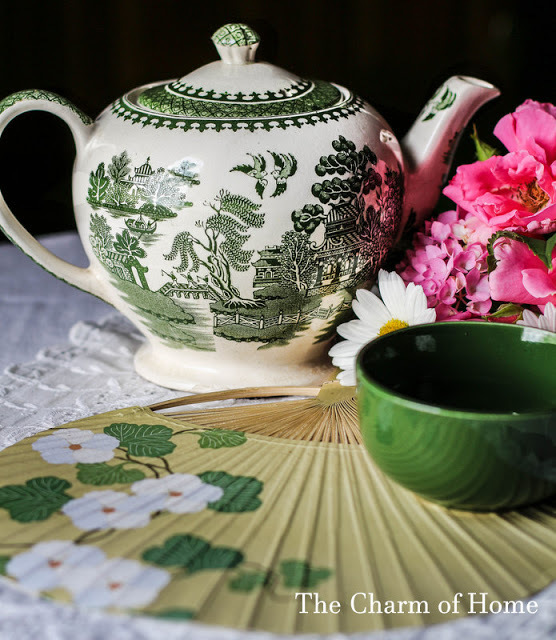 Did you know that "chintz" on china was named for the all over designs on fabric brought from India during the British Raj period during the Regency and early Victorian period from the early 1800s ? How fun is that! Hello friends and welcome to my meme, Tuesday Cuppa Tea! Fall has arrived definitely on the Olympic Peninsula...we have had our first 3 nights of frost, and each morning it has been below 40 degrees when I have opened up the blind in the kitchen when I have gotten up to make tea. The snow is back on the Olympic Mountains of Olympic National Park behind us. 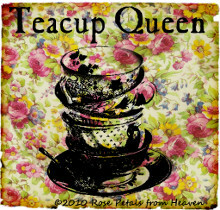 For this fall Tuesday Cuppa Tea, this is one of my favorite teacups. 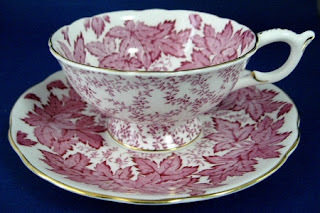 The pattern is Maple Leaves, or Maple Time by Coalport, England and it was made between 1945-1962. I love the shape, the chintz and the color. It was actually made in several other colors, but I love the richness of the magenta, or dark pink. There's a nice little bit of gold trim as well. I think it is so elegant! Like all Pacifin Northwesters, when the weather is lovely, we are out taking advantage of it. Such was the case last week, just before a storm came in a fall put in it's real appearance with rain and wind. 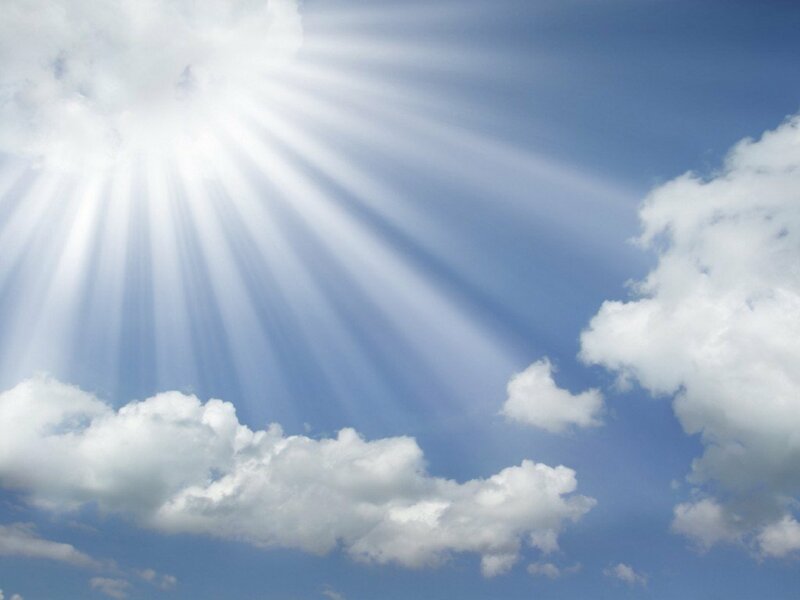 We woke up, saw the sun, and said....day out!!! 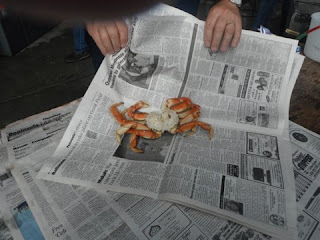 We headed down highway 101 east from Sequim to Seqim Bay State Park, which is a favorite with campers, boaters and shellfish hunters. Sequim Bay oysters are a big thing here...although we don't like oysters, so that's not what attracts us. 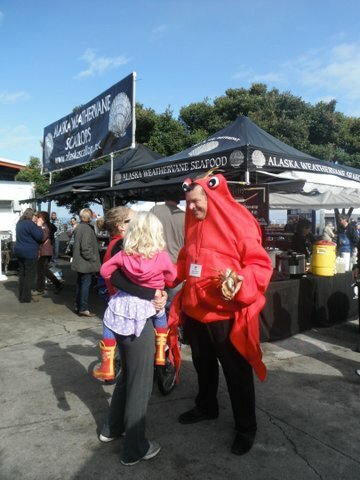 For us it's the scenic beauty of the coast...in this case the sheltered Sequim Bay, and the wonderful sea air. This didn't photo well, but the beach everywhere is littered with oyster shells. There are even huge piles of them in some places, so many are harvested here. 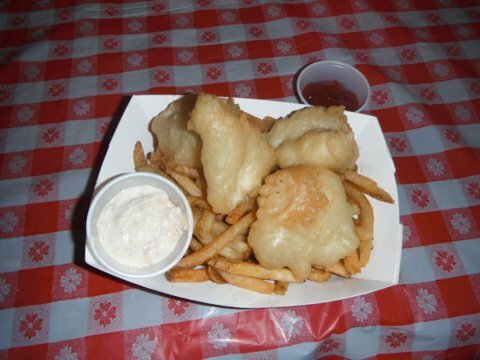 There are strict rules and regulations about seasons, permits and allowable sizes and quantities of the catch as well. By the boat ramp with all the notices and regulations, is this great sign Kids Don't Float, and a tray of loaner children's life vests. This is a feature of most of our boat ramps, and I think it is a great idea. As this area is known for it's lavender production, no surpise even the parks are planted with lavender. This late blooming trio is the shorter Spanish lavender with a more compact lavender head with topknot petals. 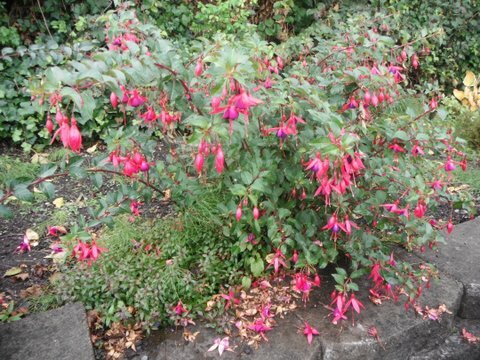 A very nice landscaping shrub around here. We were so glad we took advantage of the day to visit the park, and sit in the sun admiring the bay. The next day was quite windy, pouring rain and 20 degrees cooler. But...that's fall, isn't it? 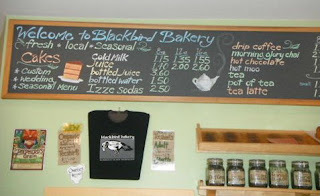 Please sign onto the linky if you have a tea related post. 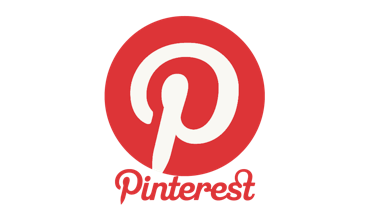 I would love it if you would leave a comment, and visit the other blogs, hopefully with a cup of tea in hand! 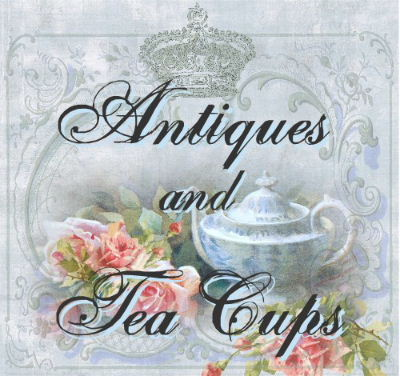 For more info about the teacup at Antiques And Teacups, and have a wonderful day! Hello! It is definitely fall outside...showers and wind...branches and leaves down everywhere! I am joining Beverly at How Sweet The Sound for Pink Saturday...with a fall theme. 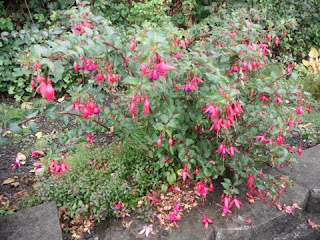 For a pink...this is one of the last blooming fuschias in the garden. I will miss the blooms during the winter. 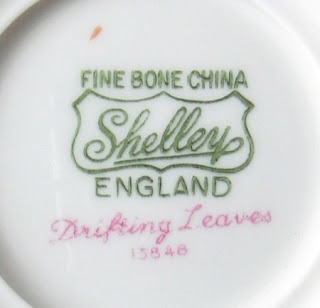 And here is some Shelley China, England pieces that I have in the pattern called Drifting leaves. Thought that was appropriate for today! I have a teacup, sandwich tray and cups and saucers in the pattern. 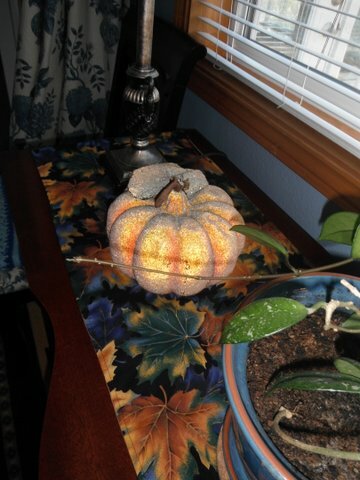 I think it is perfect for fall. The set was made only between 1956 and 1966 when the pottery closed. 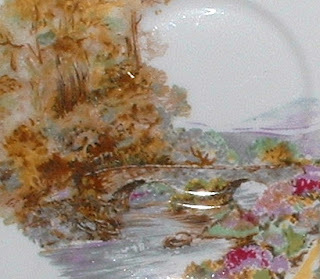 For more info on the china at Antiques And Teacups, click on the photos. I don't do a lot of seasonal decorating anymore...with a business to run and a husband with Parkinson's Disease, I don't have a lot of extra time. 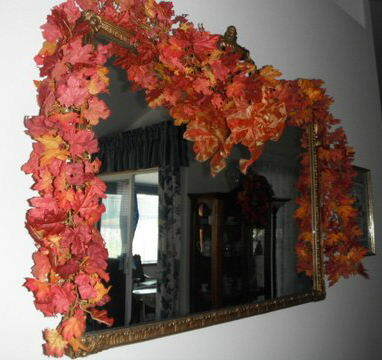 I did put up a fall leaves garland around our dining room mirror. 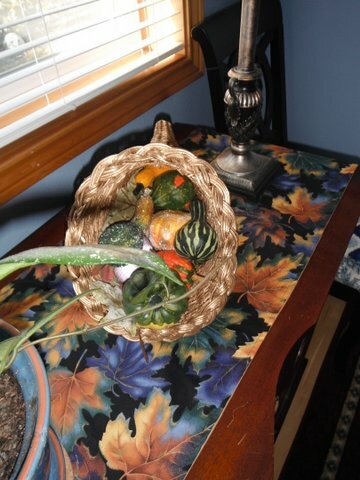 I also put a couple of items on the buffet. I had to look a long time a few tears ago for a fall runner that had blue in it, because the house is basically blue and white. I have Waverly toile in the dining room and kitchen with coordinating stripes. Simple, but I like it. I was glad I'd already gotten them out when the kids called last week on Thursday to say they were flying in on Friday morning! 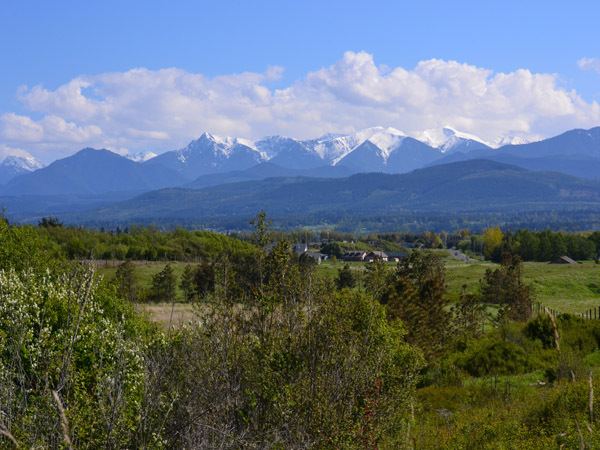 Tomorrow we go to a special meeting given by my husband's neurologist, Dr. Jennifer Witt of Swedish Neurological Institute in Seattle, about current research and treatment for Parkinson't in Port Angeles, 15 miles away. 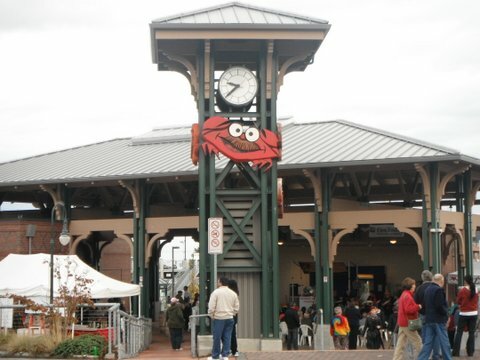 It is always wonderful when we get someone over here on the Olympic Peninsula, and we don't have to drive into Seattle which is a horrendous thing at the moment with all the retrofit work they are doing. So that will be an interesting day...they're even throwing in lunch! The meeting is at the Red Lion Hotel. Nice! 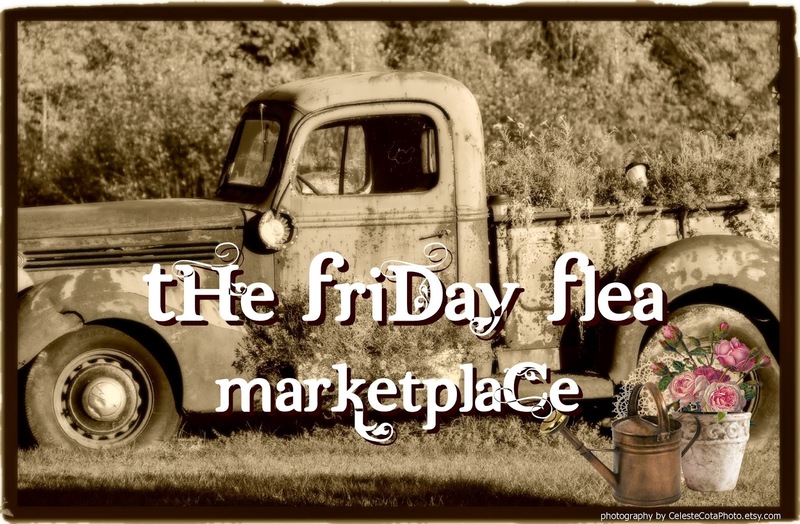 Have a great time visiting the blogs participating in Pink Saturday, and have a wonderful weekend. Hi there! It's Thursday, and I'm a bit late with my post. Been recovering from our whirlwind 4 days with our son and daughter from out of state...laundry, restocking the pantry, you know. But I am joining the wonderful blogs below. 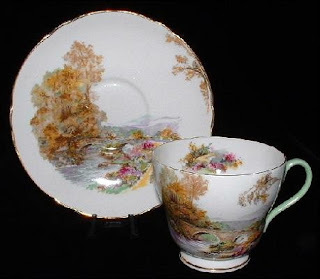 Being fall here...40 degrees at 7am and not likely to reach 55 degrees later, I thought about this Shelley Heather pattern teacup...appropriate...looks fallish to me. 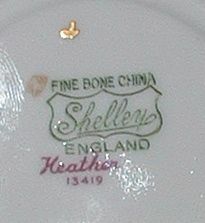 Sheyyey China, England made quite a few landscape patterns, and Heather was the first they designed, and one of their most popular. 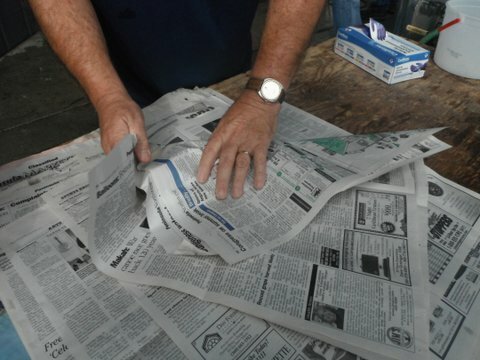 They made it in about 6 different shapes and also mixed it with other patterns over most of their time in business until they closed in 1966. 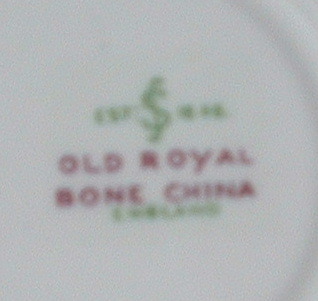 This particular cup and saucer is in the Richmond shape, with green trim and was made somewhere between 1940-1966, because the mark didn't change much during that time. I love the design. 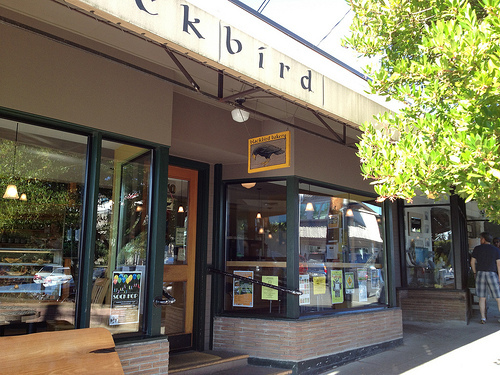 Not only does it make me think of favorite places in England, but also of area close by here in Washington State...which in some ways (in the Western part) is quite similar to England in places. 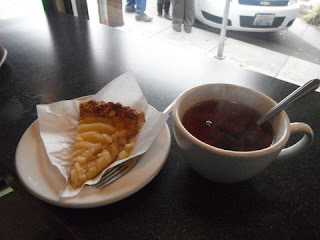 Last Friday, as we waited for our kids to arrive from Seattle airport...via light rail to downtown then the Washington State Ferry to Bainbridge Island where we were to pick them up, we had enough time to stop for a cup of tea. Blackbird Bakery is a favorite place on the island for that. There logo is above. 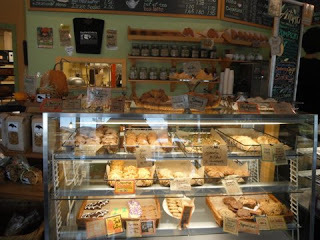 The front of the bakery is a bit difficult to photo with the trees. Hope your day will be a lovely day full of fall and fun. Visit the following blogs I visit on Thursday. 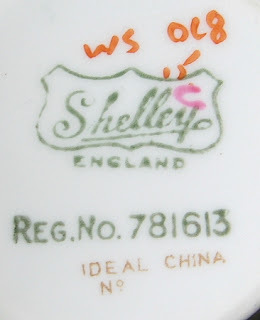 For more info on the Shelley teacup at Antiques And Teacups, click on the photos. 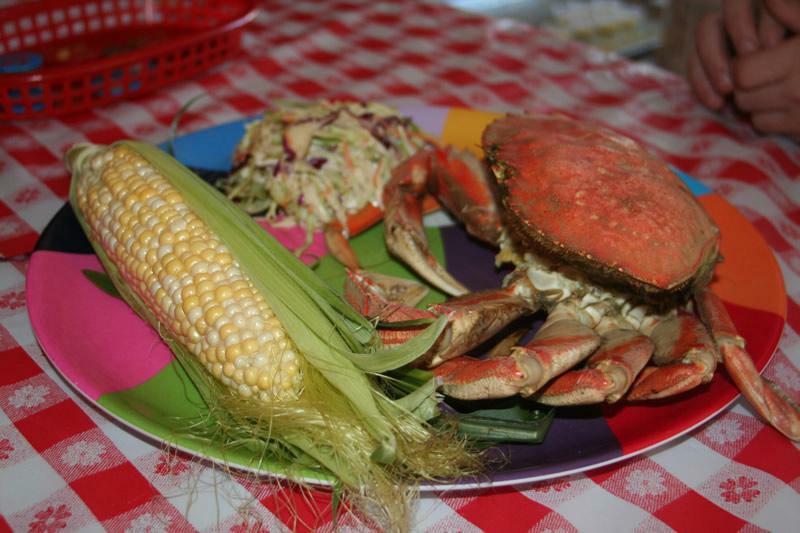 By the sea, by the sea, by the beautiful sea...We can sing that a lot around here! 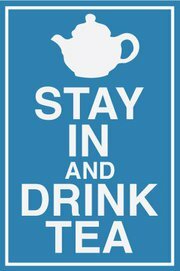 Welcome to Tuesday Cuppa Tea, a meme for tea lovers, and all things tea! 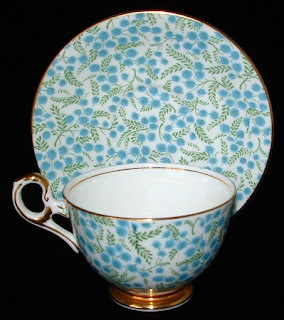 This teacup trio as it's called, is a cup and saucer with matching plate in the English Aesthetic style of design. The Aesthetic Movement started in the 1870s with organic design and the ideal of bringing natural beauty to all objects. William Morris is a famous founder, and stood for Art For Art Sake, and as William Morris put it...and it's my motto for Antiques And Teacups at Etsy, "Have nothing in your home that you do not know to be useful, or do not believe to be beautiful". 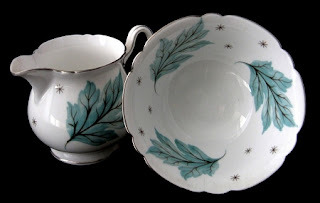 The ironstone teacup trio was made by an unknown Staffordshire, England maker. The design and form/material of the clay dates it to 1870-1890 and it is usually called the generic term of Antique Staffordshire. 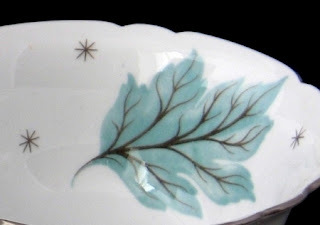 The design of sea shells and sea weed is a lovely hand colored mulberry transferware. I just love it! 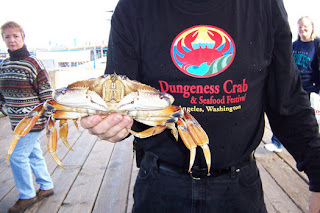 The reason I thought about sharing this today, is because the kids happened to arrive for the annual Dungeness Crab & Seafood Festival in Port Angeles. PA as we call it) is about 15 miles away, and is where the ferry leaves on the route to Victoria, BC Canada. Here are some of the photos I took of the wonderful day we had. Heavy rain had been forecast, but we had our time at the festival and got home before it started. The Port Angeles Community Pier Clock Tower, the main approach to the festival. The first order of business was lunch! 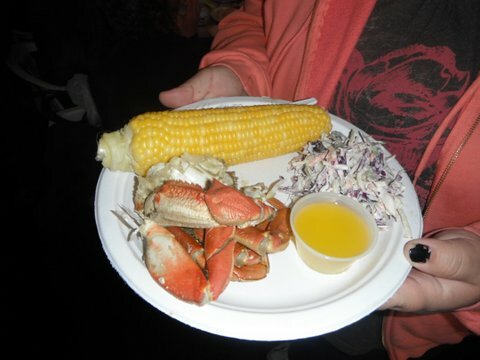 Our kids are from landlocked Utah and love seafood, so the main crab feed plate with corn on the cob and coleslaw from Nash's Organic Farm in Sequim. The Dungeness crab gets it name from our area...just by Sequim is the Dungeness Spit and Dungeness Lighthouse near the place where the Dungeness River dumps into the ocean. 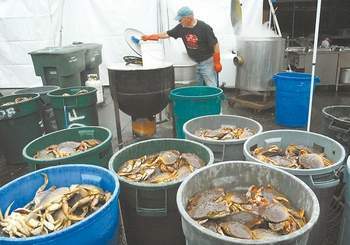 All of the crab had been freshly caught in the last 2 days and kept in tanks until....well, you know! 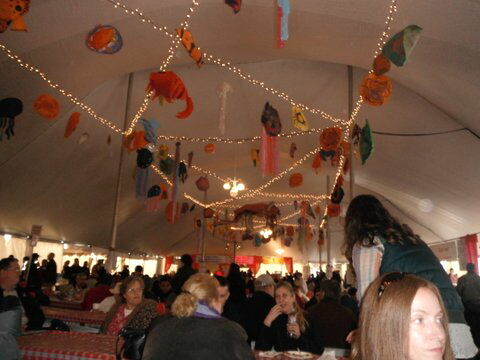 This is the inside of the tent, and that's my DIL Casey in the bottom corner! Below, is what I opted for...Local Halibut and chips. 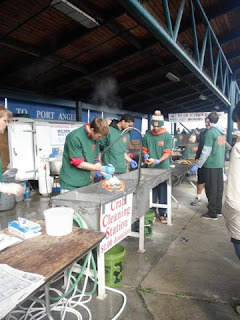 The halibut was locally caught the day before as well. The best!!! All together a wonderful day! The sun came out, it was lovely! We all went home full and happy, and just as we turned into our driveway it began to sprinkle. Perfect! 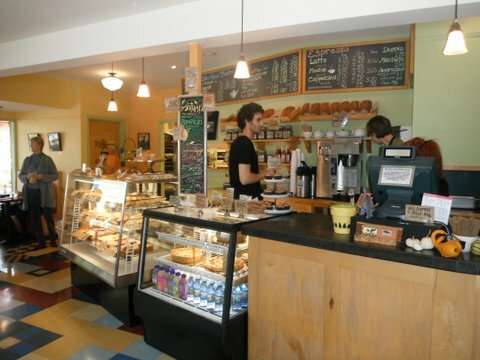 Thanks for visiting Tuesday Cuppa Tea! 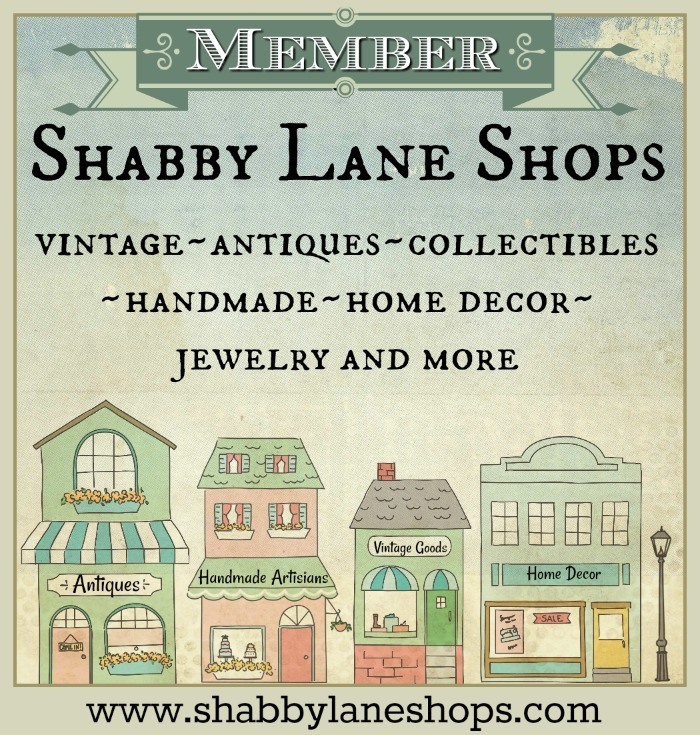 Here is the linky and a list of some of the blogs I am joining. Have a great time visiting them. 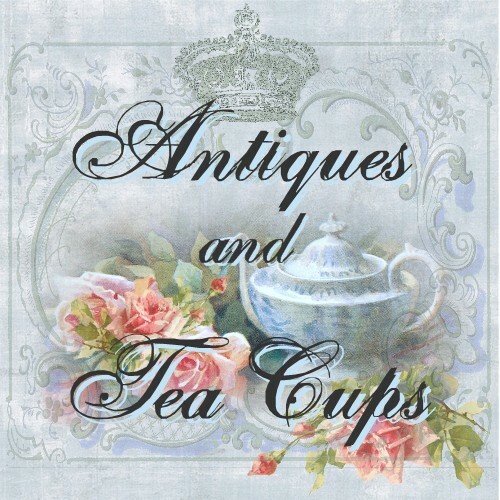 For more info on the teacups trio at Antiques And Teacups, click on the teacup photos.